If you've been on my blog in the last few months, you'd know that I absolutely LOVE LuLaRoe. They are clothing items that are very limited availability with exclusive prints. They make 1250 items in each print, so are pretty rare! I love the clothes for myself, they make me feel comfortable and modest in my own skin and they really make me shine. BUT recently they came out with a MEN'S Tee called the Patrick. We got one when they first came out, that my husband really loves and now we were sent a second one to try. He's had this red one for a while and it's been washed a few times. It's also a bit thicker of a material so tends to run a tad smaller. Also take note. ALL LuLaRoe items are HANDMADE by seamstresses throughout the world. So there WILL be discrepancies in sizing. No 2 items will be exactly the same. All of the items are INCREDIBLE quality. They are all handmade/hand sewn and are just one of a kind. All LuLaRoe items are simply amazing, most comfortable clothes you'll ever wear and they are all modest and make you feel beautiful about yourself which still being covered up and modest! All dresses/skirts come to at least the knees and all tops have sleeves of some sort. And this even applies to the men. The tees are so incredibly soft and have that extra coverage in the back to help them feel covered and secure. No plumber's crack with the Patrick Tee! Price: The Patrick Tee is $40 but it is worth every penny. Overall: ***** my husband loves his Patrick Tee! You guys are amazing. Thank you. I love LuLaRoe. The clothing is extremely comfortable. I'd love to get a Patrick shirt for my hubby so he can understand my love of the clothing. Thanks for this wonderful opportunity! I HAVE tried LulaRoe, but want my son-in-law to be able to try it as well, so fingers are crossed. I would love to get these for my hubby! Don't own a Patrick tee but my husband has been wanting one. We haven't tried and think it be worth the try. I love LLR, and I'd love for my hubby to understand they hype too. I don't own any Patrick tees... My hubby is away concerned with the length of shirts when he raises his arms above his head because he is self-conscious, and doesn't want his tummy to show. I think Patrick tees would be perfect for him and he'd love the quality and comfort! No we haven't but it sounds great! We have never tried the Men's shirts but they look so comfortable, we would like to try them. I have tried LLR but my husband doesn't have anything yet. 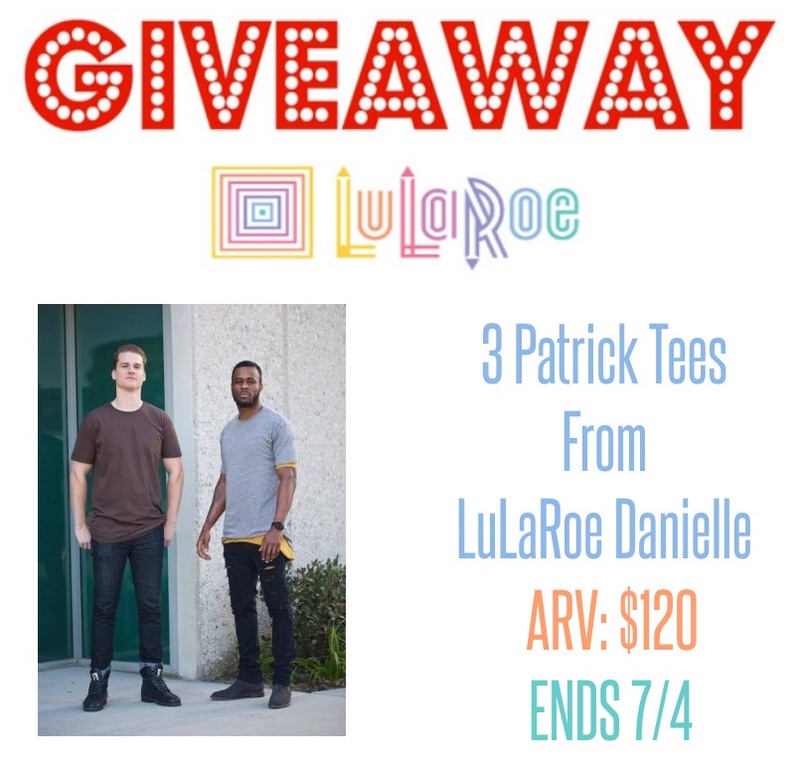 I'd love to get him a Patrick T.
We have never tried LuLaRoe before. No, we have never tried LuLaRoe, but I would like to. Wr haven't tried these, but they look great! I believe I may have tried them, but I don't think my husband has. Neither one of us have tried them before, but I believe my husband would seriously love these shirts! He is a texture person! My hubby would love to try these. I already love Lularoe and own a variety of clothing. We have not tried the brand but the shirts sound like something my son would like wearing. I have tried LuLaRoe! I own a bunch of leggings and a few irma's! They are my most comfy clothes! I dont believe he has but I cant be 100% sure. I have one Randy. My D-I-L is trying to talk me into trying the leggings. i have tried some of the leggings and i love them! I have and Im hooked!!! Hubby hasn't tried it yet! I have heard of them but never tried any of their clothes...yet! No, neither my husband or I have ever tried LuLaRoe. We haven't tried this brand before but would love too! We have not ever tried LuLaRoe as of yet. I can't wait to try the leggings I ordered the other day! Neither one of us has tried it, but I have heard great things. Yes I have and I love my leggings and Nicole Dress. I am looking forward to having my hubby try the Randy T-shirt! Neither one of us have, but it looks like they have a lot of nice items. No, we have not tried this brand before. I adore the Lularoe leggings! I have two pair. I have heard about them but not tried them yet. No I haven't yet but am really interested. I appreciate a soft well-made shirt.